Own As Time Goes By Series 1 to 9 Complete Collection DVD from Deff, DVD, Blu-Ray & 4K Video Specialists - Free UK Delivery.. It is a full house for the Hardcastles when Sandy and Harry return from Canada and move in. Jean is already imagining the pitter patter of tiny feet and, somewhat prematurely, arranges for cots to be delivered - much to the distress of Lionel. Meanwhile Sandy is convinced that Harry has a death wish when he applies to join the armed response unit in order to gain promotion and Alistair starts to behave rather peculiarly. Just when every.. In the early 1950s, Jean, a student nurse and Lionel, a young army officer meet and fall in love. 38 years later, their paths cross again. Older, wiser, nevertheless they discover that though love has a different pace and priorities, the heat of old flames can still be rekindled. The course of true love never did run smooth and for Lionel and Jean the road begins pretty bumpily! Could it be Lionel's agent, Alistair, who captures Jeans a.. In the early 1950s, Jean, a student nurse, and Lionel, a young army officer meet and fall in love. 38 years later, their paths cross again. Older and wiser, nevertheless they discover that though love has a different pace and priorities, the heat of old flames can still be rekindled. There's only so much a fledgling relationship can take. So it's a wonder Lionel and Jean are still together after ridiculous photo shoots, sniggering colle.. In the early 1950s, Jean, a student nurse, and Lionel, a young army officer meet and fall in love. 38 years later, their paths cross again. Older and wiser, nevertheless they discover that though love has a different pace and priorities, the heat of old flames can still be rekindled. Jean and Lionel have reached the point in their relationship where it seems natural to move in together - that is, if they can agree on who is going to do ..
Own As Time Goes By Series 4 DVD from Deff, DVD, Blu-Ray & 4K Video Specialists - Free UK Delivery..
Own As Time Goes By Series 5 DVD from Deff, DVD, Blu-Ray & 4K Video Specialists - Free UK Delivery..
Own As Time Goes By Series 6 DVD from Deff, DVD, Blu-Ray & 4K Video Specialists - Free UK Delivery.. In the early 1950's, Jean, a student nurse and Lionel, a young army officer meet and fall in love. 38 years later, their paths cross again. Older, wiser and still as capricious, they discover that though love has a different pace and new priorities, the heat of old flames can still be rekindled. Jean thinks old age is creeping up on Lionel, but he refuses to acknowledge this. Judith is taken aback when Alistair proposes and Jean meets u.. In the early 1950's, Jean, a student nurse and Lionel, a young army officer meet and fall in love. 38 years later, their paths cross again. Older, wiser and still as capricious, they discover that though love has a different pace and priorities, the heat of old flames can still be rekindled. 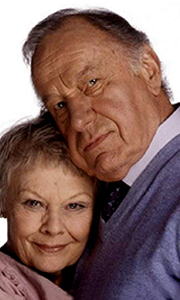 Lionel gets a suspicion that he's being followed and then Jean takes a liking to his admirer. There's a bathroom 'incident' that disrupts the whole..